Mike Abdul's marriage to his pretty wife, Vivien Stephen has hit the rocks. The wife who is equally a gospel singer is alleged to have moved out of her matrimonial home. 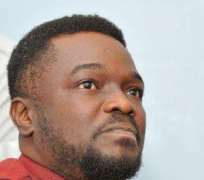 The Morire crooner, according to sources, has remained adamant about the break as he has refused to make any comment about it. Recently, he has decided to throw away his calm nature today and voiced out his feelings towards the development. Their marriage cracked due to infidelity on the part of the gospel artiste, Mike, we learnt, he's dating a certain singer, Monique Rasqie. They both were said to have been in a relationship for some months now, the wife, rumour has it, left the house when Mike has refused to discontinue his relationship with Monique. When asked about the collapse in his marriage, Mike started with a curse, hear him, "you don't really know the devil's tricks until he plays it on you. May the conscience of evil doers be their judge. When they seek honour, they will not find it. They will not lack shame and misfortune in their generation. They and their supporters shall partake of immense losses. All bloggers and media places that have risen to do me evil shall be plagued with evil for the rest of their days." There is an indication that Mike is actually referring to his estranged wife, insinuating that she collaborated with the media to do him evil.